What does it say about Canada's great debt to Scotland that "The Greatest Canadian" was born in Falkirk, Stirlingshire? All eight of Thomas Douglas's sons worked as iron moulders in the Carron Iron Works. In addition to the trade, the brothers also shared a Presbyterian faith and a fervently Liberal political outlook. Like most Scots of the working classes, the Douglas brothers only had elementary schooling; they later took it upon themselves to supplement their education through books in the public library. Tom, Tommy's father and the eldest son of Thomas, began working full-time at the foundry when he was fourteen. He joined the Argyle and Sutherland Highlanders Regiment to serve in the Boer War and returned "sickened ... by the butchery of war and the thankless lot of a foot soldier." 1 When he turned his back on the Liberals to join the Labour party, Thomas senior evicted him from the house. Thomas left for Winnipeg in 1910 after hearing favourable reports from his brother William, who had already spent several years in Canada. Annie and her three children - Tommy and two younger girls, Isobel and Nan - followed in 1910. Thomas worked in the Vulcan Iron Works, and the family rented a house on Gladstone Street. The neighborhood was full of frame houses with outdoor toilets, and was crowded with immigrants from every part of Europe - only the Douglas family could claim British descent. "You lost all sense of racial or national pride," Tommy explained of the experience, "and began to realize the value and worth of people of other races." The kindness the neighbours showed to each other instilled a lifelong hatred of racial or religious intolerance in Tommy. In Scotland, Tommy had fallen and cut his right knee on a stone; the minor wound failed to heal properly, resulting in osteomyelitis, an inflammation of the bone and marrow caused by infection, in the lower femur close to the knee cap. He had had three operations, all of which were performed on his family's kitchen table with his mother and grandmother assisting the doctor by administering the chloroform, before coming to Winnipeg. Tommy's elementary schooling was repeatedly broken up by hospital stays necessitated by osteomyelitis flare-ups. He had to use crutches after being discharged on one occasion in 1914; when the winter snow began to fall, he could not get to school, as only one family in the entire district owned a car. One day, two young neighbour boys, one Polish and the other Ukrainian, appeared at the door with a sled. They informed Annie in broken English that they would pull Tommy to and from school each day. Their willingness to help another immigrant boy resonated with Tommy for the remainder of his life. In many ways, Tommy's childhood condition provided the impetus for the work he would undertake as an adult. The major turning point in his life occurred before he was released from this 1914 stay in Children's Hospital: doctors finally decided that the leg would have to be amputated. While Tommy's parents were decided whether to agree to the amputation, Dr. J. R. Smith, a famous orthopedic surgeon, took an academic interest in the boy's case while touring the ward with students. He told Thomas and Annie that he would be willing to provide his services to Tommy free of charge, provided they allow his students observe. After several operations, Dr. Smith managed to save the leg. While Tommy felt he owed Dr. Smith a debt of gratitude, he knew that if he hadn't been so lucky as to have the doctor offer his services gratis, he would have lost his leg, as his parents lacked enough money to hire a man of his standing. "I felt that no boy should have to depend for either his leg or his life upon the ability of his parents to raise enough money to bring a first-class surgeon to his bedside," he surmised. "And I think it was out of this experience ... I came to believe that health services ought not to have a price tag on them, and that people should be able to get whatever health services they required irrespective of their individual capacity to pay." 8 Dr. Smith's generosity later fuelled Tommy's dream of universally accessible medical care. The Douglas family lived in Winnipeg until the outbreak of the war, and returned to Glasgow in 1914 so that Thomas could enlist with the army. They lived at 63 Clarence Street, near the Cooperative Wholesale where Annie's father worked. There, Tommy finished school and followed his mother in the regular practice of her Baptist faith. He was quickly absorbing the ideas of the Independent Labour Party, a radical branch of the British Labour Party that held Christian altruism above economics, and he listened to radical leaders such as Jimmy Maxton and Willy Gallacher preach at Glasgow Green. Tommy and his father debated politics at every family meal. Thomas hated class distinction, the strict hierarchy of British society; he had inherited Burns' independence and pride, and had found the mobility and mixing of Canadian society to be more reflective of his values than British society. Fourteen-year-old Tommy was also happy to return, where he would be free to roam the woods and riverbanks without fear of trespassing on noblemen's lands. Thomas's employment with the Vulcan Iron Works was uncertain. In addition to the danger of the job, there was no pension, health insurance, or unemployment insurance. In the 1920s, the Douglas family, like many other families across Canada, was struggling to get by. But the family was supportive when Tommy decided at nineteen that he wanted to become a minister, even though the religious life would not procure as much money as the printing industry. Tommy was officially ordained a minister in the Calvary Baptist Church in June 1930, a few days before his twenty-sixth birthday. Each summer the Weyburn congregation granted him a leave to pursue his doctoral studies at the University of Chicago, and he completed his Master's thesis, a Christian sociology study of the underprivileged family, by correspondence classes with McMaster University in 1933. Tommy married Irma Dempsey, a Methodist girl he had met during the two years he had spent preaching at a Presbyterian congregation in Carberry, Manitoba, during college, two months after his ordination. Irma, a farmer's daughter, had also gone to Brandon College to study music, and became a music teacher after graduation. While Tommy was studying in Chicago during the summer of 1931, he spent three weeks studying the 75,000 transient homeless men in Chicago. He found that they were just like him: they had come from the same types of families, they had had good jobs as railroad workers or bank clerks, some of the boys had been medical or law students. But when the savings they were living on after losing their jobs ran out, they ended up in "jungle land". Economic systems switched from being academic questions to critical social concerns. And as Tommy struggled to show flock that they needed to live out Christ's mission to create a Kingdom of Heaven on Earth, he began to realize that he could not cure the misery he saw all around him through ministry alone. One of the first things he did when he returned to Weyburn in the fall of 1931 was organize the unemployed; he procured an old, empty house from the city, scraped together enough money for some coal and a telephone, and set up an unemployment association to generate odd-job type work for the men on an organized basis. "I never thought a man could save his soul if his belly was empty or that he could think about things like beauty and art if he had a toothache," he remarked in conversation fifty years later. The plight of the rural community plagued Tommy as well. Much of his congregation was composed of farmers; he saw hard-working, well-to-do families lose their farms and their homes, the products of their lives' work, through no fault of their own. Every week during the fall of 1931 he saw families pile what little possessions they had left into a wagon and head north to try and "wrest a home for themselves out of the bush". 14 The situation seemed utterly hopeless. Farm organizations involved the minister with their problems more and more. In the spring of 1932, some of the local farm leaders went to Tommy for advice on merging the labour group and the farm group. Having no experience in the area, Tommy wrote to his Parliamentarian for advice, who suggested he consult Alderman Coldwell of the City of Regina, who had recently written a similar letter suggesting the labour and farm organizations merge in Saskatchewan. Tommy arranged Weyburn's first big political rally in 1933, in hopes that the farmers, workers, and unemployed people who had been coming to him for advice, relief, and organization could take control afterwards. But in 1934, no member of the Farmer-Labour Party wanted to run in the provincial election, which was certain to go to the Liberal candidate, a much-loved old family doctor who had been practicing in the area for forty years. The campaign goal for the Farmer-Labour party was publicity and education: finally its leading members convinced Tommy that it was his duty, as a founding member, to run. Tommy conducted the campaign "like a college professor giving a course in sociology. I had charts and so on, and I'm sure half the people didn't know what I was talking about." 16 His presentations helped the audiences to understand why the present capitalist society could never adequately solve the problems of distribution at hand. Thousands of people, meanwhile, were turning out to hear Coldwell speak across the province. In the end, the Tories were annihilated, the Farmer-Labour Party won five seats in the Legislative Assembly, and the Liberals took all the rest. The Farmer-Labour party evolved out of that campaign into the Cooperative Commonwealth Federation (CCF). 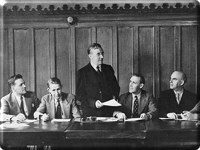 In his first session of Parliament, Tommy took the speaker's podium sixty times, addressing issues as diverse as bilingual currency, agricultural implement prices, the CBC, cattle, whisky, the Farm Loan Board, Cadet services, the budget, unemployment relief, social safety nets, medical costs, the Regina riot, the CCF, the Italo-Ethiopian War, the League of Nations, economic sanctions, and more. He set out basic policy ideas such as graduated income tax to reduce economic inequality and high taxes on corporations to reduce the national debt. As a representative of a region where ninety percent of the rural inhabitants were on relief and three of every five young men in the city were either homeless or living with their parents, Tommy felt a great sense of urgency to improve conditions in the west. So he found William Lyon Mackenzie King's lack of strong, dynamic leadership frustrating, and was aggravated by the prime minister's "monotonous speeches about the need for freer trade. There was nothing to indicate to a young man that we were coming to grips with our problems." 19 The people, Tommy said, had asked for bread, and Mackenzie King was giving them stone. 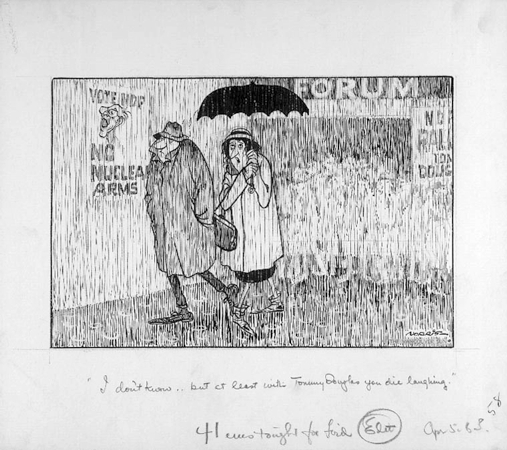 Tommy needed no convincing to vote for war in September 1939. But when Mackenzie King introduced a national resources mobilization bill in January 1940, controversy was hot. Tommy was not against the conscription of manpower; in fact, he was of the opinion that conscription was the fairest way to recruit manpower. His problem with the bill was that it gave the Cabinet the power to conscript of manpower, wealth, war industries, and managerial capacities separately. It was immoral, Tommy believed, to conscript manpower while leaving wealth in the hands of private individuals, and allow arms manufacturers to make profits above five percent for building the instruments of war. The CCF members would not vote for the bill unless conscription of all resources was made mandatory. It was not. After the 18th Canadian Parliament closed in January 1940, Tommy enlisted with the Second Battalion South Saskatchewan Regiment. He went through the officers' training courses, reaching the rank of captain, and was used as a training officer in a camp at Weyburn. He was one of six officers selected to go to the Winnipeg Grenadiers, but, to his great disappointment, was turned down after failing the medical examination for the trouble he'd had with his leg. In December 1941, one third of ill-trained Grenadiers were killed or wounded in the Battle of Hong Kong; the rest were taken as prisoners of war by the Japanese. Tommy led the ensuing debate in the Commons, accusing the government of sending unequipped, untrained men into the battle on false information. Months later, he called for a similar inquiry into the invasion of Dieppe. Tommy was elected Provincial Party Leader for the CCF in 1942 and reorganized it while the provincial Liberals were floundering, unable to provide the relief they had promised to the voters. When the Saskatchewan government called for elections in 1944, Tommy, believing the CCF had the potential to win, submitted his resignation from the House, which was read on the first of June. 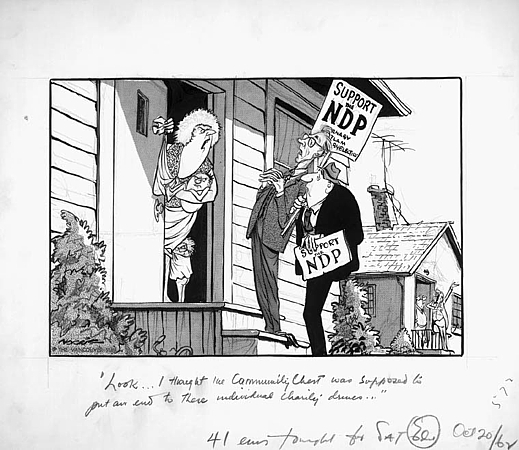 Tommy was at his home in Weyburn washing up when news came in that the first returns were indicating a landslide victory for the CCF. 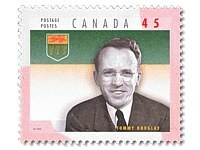 Thomas Clement Douglas served as Premier of Saskatchewan until 1961, leading his party to five consecutive majorities. Once in office, the new progressive government wasted no time in implementing the radical change the people had demanded: of the hundred-plus bills it passed during its first year in power, seventy-two of them were aimed at social or economic reform. Seventy percent of the CCF's first budget, moreover, was dedicated to expenditures in health, welfare, and education. The government's priorities were reflected by the new departments it created, including the Department of Co-operatives, the Department of Labour, and the Department of Social Welfare. In order to fund the larger bureaucracy, all of the CCF cabinet ministers took a twenty-eight percent pay cut. 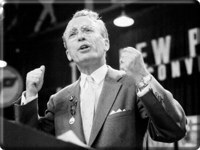 During his first year in office, Douglas introduced the Trade Union Act, which gave workers, including those in public service, the right to organize and bargain collectively. 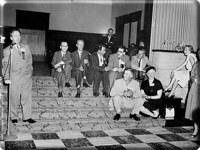 Walter Reuther, the prominent leader of the United Automobile Workers union, described the act as "the most progressive piece of labour legislation on the continent." Legislation that followed set the standards for workers' compensation, increased the minimum wage, limited the work week to forty-four hours, and introduced mandatory holidays. In just four years, union membership rose 118% in the province. Douglas, having recently witnessed the abuses of state power perpetrated by Germany and Italy, was also responsible for introducing Canada's first Bill of Rights. In 1947, the legislature broke new ground as it passed the first laws prohibiting discrimination and protecting civil freedoms from abuse by powerful private institutions and persons in addition to government actors. The first part of the bill defined fundamental freedoms, such as freedom of conscience, religion, and opinion; freedom of expression; freedom of assembly; and freedom from arbitrary arrest. The second part of the bill was revolutionary in that it protected equality rights as well, prohibiting discrimination in employment, occupations and businesses, property, accommodation and services, and in professional associations and unions. This bill preceded the United Nation's Universal Declaration of Human Rights by eighteen months, and served as a forerunner to Diefenbaker's Canadian Bill of Rights, introduced in 1960. Another of Douglas's major goals focused on industrial development and economic diversification. Eighty percent of Saskatchewan's GDP came from agriculture when the CCF took power in 1944; by 1957, it accounted for only thirty-five percent of economic activity, despite the fact that one million more acres of farm land were under production. The government made major investments in energy and transportation infrastructures in addition to encouraging the development of private industries such as potash mining, steel manufacturing, and oil drilling. Roads needed to be paved and power grids needed to be built: the dearth of work that had caused so much suffering in the 1930s seemed a distant memory. The boys who had found "security, prestige, and a feeling of belonging" in the military had been afraid to return to the Canada where they had "been on the breadlines ... ridden the boxcars, and had been working on farms for five dollars a month." 23 Douglas was determined to lead such people in building a better way of life. The new government introduced numerous new Crown corporations to provide certain essential services to the province that were either not offered by the private sector, or not available to all provincial residents on an equal basis. The Crown Corporation Act of 1945 set down the guiding principle that the Crowns would offer low-cost, high-quality services that were universally accessible. The first major corporation, the Saskatchewan Government Insurance Office, was established in 1945 to provide residents with home, renters, farm, auto, and commercial insurance. The following year, the province introduced a compulsory no-fault auto insurance program under the direction of the SGI. The Saskatchewan Transportation Company also started in 1946 to ensure that all communities had affordable access to transportation and freight services from a fleet of buses, and the Saskatchewan Government Telephones extended quality telephone services across the province in 1947. But no Crown Corporation had as great an impact as the Saskatchewan Power Corporation. The Rural Electrification Act, passed in 1949, charged the Saskatchewan Power Corporation with the task of providing electricity to the province's isolated communities. The huge infrastructural undertaking took fifteen years to complete: when Douglas came into power, only about three hundred of Saskatchewan's rural residents had electricity. By 1964, sixty-five thousand farm homes had been hooked up to the Corporation's electric grid. Lights came on in halls, churches, rinks and schools as homes filled with appliances like refrigerators, washing machines, furnaces, and water heaters, radios and televisions. New businesses as diverse as appliance dealerships, repair shops, meat lockers, and processing plants moved into the villages. New sewage pipelines brought indoor plumbing to farms for the first time. Life in rural Saskatchewan was revolutionized. Thanks to the booming postwar economy and prudent fiscal management, the Douglas administration paid off the huge provincial debt during its first term. In the 1950s, the prosperous province doubled its government revenue while increasing its spending. 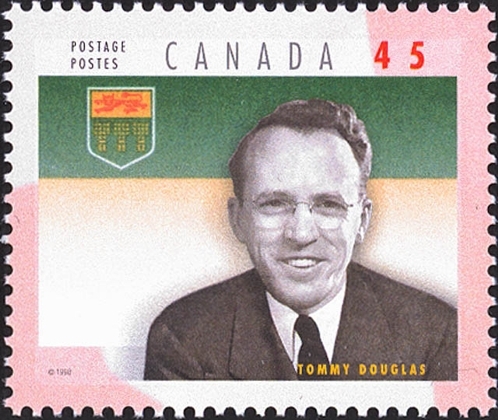 By the 1960s, the province was financially secure enough for Douglas to launch his greatest achievement: universal health care. Tommy had believed that people had a right to free medical services ever since Dr. Smith had saved his leg as a child, and the CCF began to undertake the long, massive project of reforming the health care system as soon as it came into office. They spent millions of dollars to construct new hospitals and renovate existing ones, and funded a medical school for the University of Saskatchewan. In 1944 they instituted free medical, hospital, and dental services for pensioners and funded free treatments for all residents who suffered from cancer, mental illness, tuberculosis, or venereal disease. In 1947, Douglas introduced the nation's first universal and compulsory hospital insurance program, the Universal Hospital Services Plan. 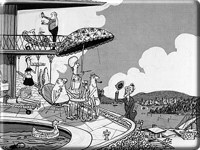 For an annual fee of five dollars per person (with a maximum of thirty dollars per family), the insurance ensured that the burden of those hospital bills that fell on the sick was distributed equally across the population. Hospitals were among the plan's biggest advocates. Over fifteen years and four terms in office, Douglas and the CCF had completely revitalized Saskatchewan, and they weren't done yet. 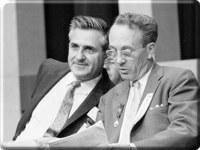 In April 1959, Douglas - supported by another Saskatchewan politician, the newly-elected Prime Minister John Diefenbaker - announced his plan for a province-wide universal and comprehensive medical care insurance program. 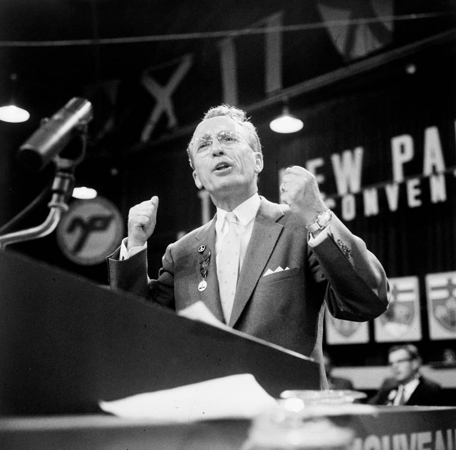 The Medicare program served as the revolutionary platform on which the CCF's 1960 election campaign was founded, and the party's overwhelming victory signaled a public mandate to bring the plan to fruition. The Saskatchewan Medical Care Insurance Bill was introduced in October 1961 and passed and given royal assent in November. The Saskatchewan College of Physicians and Surgeons, however, opposed a compulsory, government-run health care plan, and put enormous pressure on the new premier, Woodrow Lloyd, to withdraw it. On 1 July 1962, the government and the medical profession clashed: the province's doctors went on strike and ninety percent of private offices closed. Saskatchewan had become both a battle ground and a testing ground. After two weeks the strike was resolved with small amendments having been made to the Medical Care Insurance Act, and Medicare was born in Saskatchewan. Ottawa followed suit: two years later, Justice Emmett Hall, Chair of the Royal Commission on Health Services, recommended that the rest of the nation adopt Saskatchewan's model of public health insurance. 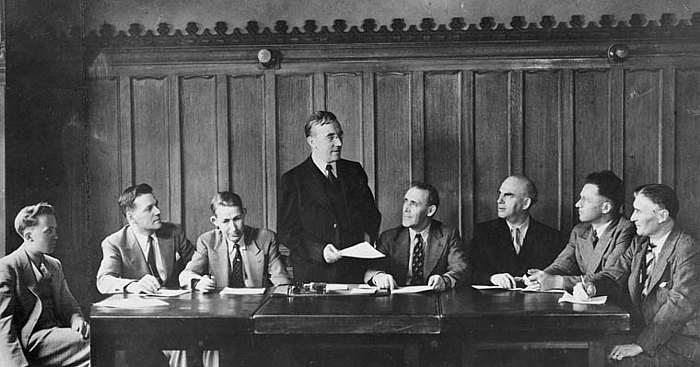 In the late 1950s, the CCF began to merge with the Canadian Labour Congress to merge organized labour and the political left into a new social democratic political party. 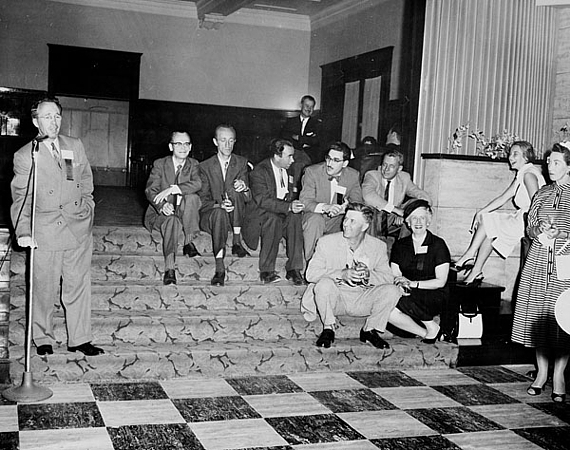 After three years of planning, the groups held a Founding Convention in summer 1961 from which the New Democratic Party was born. 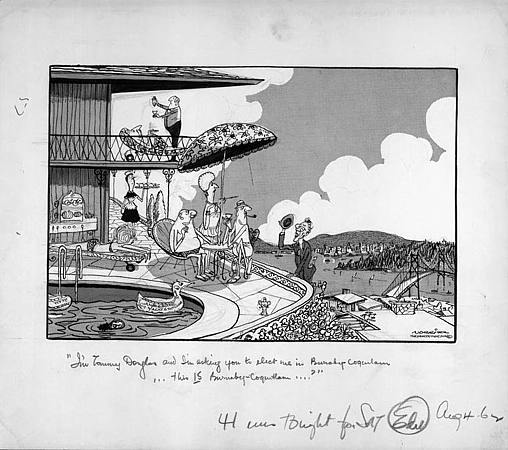 The CCF and CLC had been begging Douglas to run for leadership of the new party for two years. With the Medicare act passed in Saskatchewan, he was safe to accept the reigns of the new party. 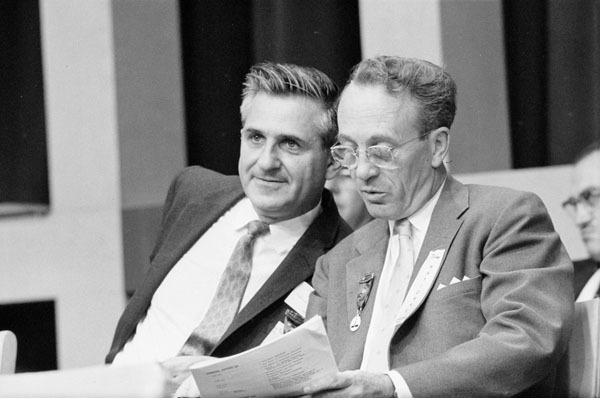 In November 1961, he stepped down as premier to return to Ottawa as the leader of the NDP, approaching the position with the same "somebody-has-to-do-it-attitude" he had assumed throughout his political career. Before stepping down as party leader in 1971, Douglas engaged in one last ferocious battle for freedom and civil liberties. During the October Crisis of 1970, Trudeau, at the request of the Quebec government and the mayor of Montreal, and with overwhelming popular support, asked the Governor General to invoke the War Measures Act. Within hours, hundreds of suspected Front de Liberation du Quebec members and sympathizers were taken into custody and detained without warrants. Douglas and sixteen other members of his caucus stood alone in their refusal to vote for invocation of the act: over reprimanding cries of "Shame!" from Liberals and Tories, Douglas shouted across the Commons floor, "The government, I submit, is using a sledgehammer to crack a peanut!" 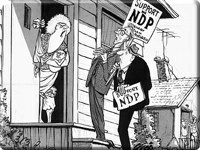 Douglas' principled stance against the War Measures invocation came with a heavy political toll: the NDP's public approval rating dropped seven percent in the public opinion polls and there were sharp divisions within the party. Documentary film-maker David Brittain referred to it as "his finest hour, certainly his loneliest." 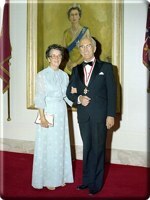 Douglas retired from the House of Commons in 1978. He spent much of his retirement on Parliament Hill, however, remaining a passionate voice within the party as its energy critic. 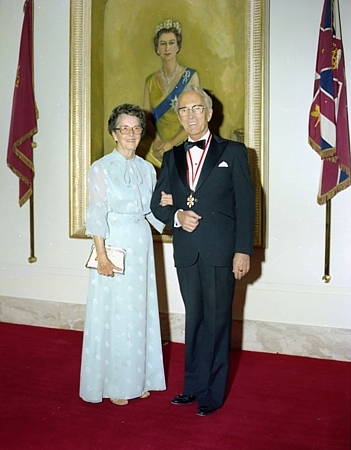 He was made a Companion to the Order of Canada, and named to the Queen's Privy Council for Canada in 1984. He remained healthy and active up to his eightieth year, telling the Globe and Mail that he walked up to five miles a day. He died of cancer in 1986, at the age of eighty-one, in Ottawa. His daughter, actress Shirley Douglas, has taken up his banner in the fight for Medicare as an activist for the NDP. "He's a good deed in a naughty world. He's a breath of clean prairie air in a stifling climate of payola and chicanery and double-talk and pretence, global and local. Forget the politics. Here's a man who wanted to do something good for the whole human race. . . . To call him a politician . . . is to insult him. He was and is a dreamer and a humanitarian, incorruptible, genuine, and intellectually honest." The "little fellow with a big idea" left his adopted country with a legacy of innovation. 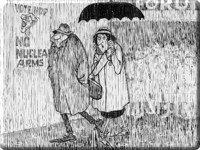 Ideas that were radical and controversial several decades ago - social welfare, universal health care, old age pensions, maternity benefits, and more - have become doctrines of Canadian life. All he ever wanted to do was make the world a little bit better for the unfortunate - and in chasing his dream, he revolutionized the nation.